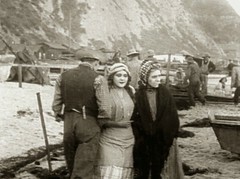 The unspoiled natural beauty of the Bay of Naples, 1914, becomes little more than a scenic backdrop as a fade-in reveals the imposing presence of diva Francesca Bertini as “Assunta” in the opening shot of the film adaptation of Salvatore Di Giacomo’s Assunta Spina (Caesar-Film, 1914), directed by and starring Francesca Bertini and Gustavo Serena. “DIVA“ is a word that conjures an image of a haughty (and frequently quite young) woman with a “don’t mess with me” attitude. It begs not the question, “Why would we want (or not want) to mess with you?” but rather, “Why should we care about you at all?” In that debased form, diva came into popular usage in modern American English in the 1980s at first applied to aging pop stars who launched comebacks, and then it metastasized — it was applied to new, young talent with “attitude,” as if churlish personality, adolescent pouting and immature posturing were qualities that set one apart from the rest of the field and made the poseur worthy of our attention and acclaim. This usage destroyed, in English-speaking lands to be sure, the original Italian word which was meant to describe a talent and presence far outside normal everyday being. Not simply a star that one day burns out and grows cold, but a being beyond “star,” something permanent, eternal, divine in essence: always with meaning, never the object of nostalgia, and impossible to forget because it is one with the culture, with life itself, life as a divine creation. It is a strange, pretentious-sounding concept to English-speaking cultures, especially America, a nation originally conceived by protestant Christians from western Europe. Used carelessly, the word becomes instantly worthless, ludicrous. Despite our absorption with celebrity, the idea of humans giving deity status to performers, mere “entertainers,” seems to exceed even our own well-trod boundaries of propriety and taste. But within the context of the culture in which it was created, diva is rich with meaning. The divas capture the essence of that culture, in a sense, they are its protectors and preservers, representing core values of that culture, not merely a form of entertainment. That degenerate form is our popular culture as it now exists. In reality it is an “anti-culture” because it mocks a genuine culture — that is, one based upon shared knowledge and experience. It also is self-mocking, leaving us with nothing but a culture of mockery. It pretends to lampoon seriousness, but does so in such a vile “take no prisoners” manner without genuine humor, it creates a deep feeling of sadness, a cultural melancholy. Popular culture as practiced now is suicidal — it devours alive both itself and those who partake of it without thinking, those without the solid foundation of a core culture. Francesca Bertini was born in 1892 in Florence, Italy. As Elena Vitiello, she was adopted by Arturo Vitiello, a Neapolitan writer, and a Florentine actress Adelaide Frataglioni (an alternate version of her origin is that she was born to a Florentine actress and adopted by Vitiello who took her to Naples). She spent her childhood in Naples where she first appeared on stage in comedic productions and assumed the stage name “Francesca Bertini.” At eighteen, she appeared in a minor role in a Neapolitan production of the stage play Assunta Spina by noted playwright Salvatore Di Giacomo, whose work would play an important role in her career in a different medium within a few years. 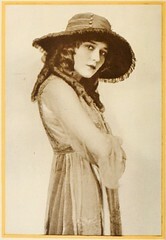 But her stage work garnered enough attention to be noticed by the Italian division of the Pathe Film Company, Film d’Art, which cast her in a series of short films based upon staples of early Italian filmmaking: historical dramas and important works of European dramatic literature, including opera. At least two of those films from 1910-1911 survive. Both are adaptations of Shakespeare, “King Lear” and “The Merchant of Venice.” Both were meticulously hand tinted, frame-by-frame, and when viewed (even in still frame) seem miraculously alive to us despite being incomplete and shot in black and white one hundred years ago. These beautiful films give black and white diehards (including yours truly) pause . . .
“Re Lear” (“King Lear”), Film d’Art, 1910, directed by Gerolamo Lo Savio:. The aged and senile King Lear has three daughters who have gathered to honor him: first Regan and Goneril (in the blue and golden gowns) present him with lavish gifts and gestures of love . . . The youngest of the three daughters, Cordelia (Francesca Bertini), the only one as yet unmarried, has nothing of value to give her father except her declaration of love. But the King is insulted. He reprimands the girl and orders that she be given in marriage to a member of his Court. At least her husband-to-be seems pleased with his gift. Above, three frames from monochrome tinted fragments of this one-reel film, which does not survive complete in either format. 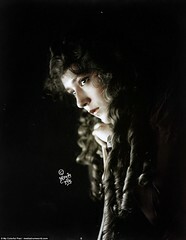 Francesca Bertini portrays Jessica, daughter of Shylock the lawyer, in this beautiful hand-tinted film which, again, survives only as an incomplete “fragment” of the original one-reel film. At 21, Bertini moved to Rome, and in what may have been her first credited film role as “Francesca Bertini,” she played the male lead in The Story of Pierrot (Celio, S.A., 1913), directed by Baldassare Negroni. 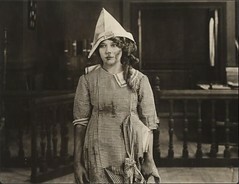 Francesca Bertini had made six other films for Celio in 1914, five of them features including one that did not get an American release that year, Sangue Blu (“Blue Blood”), directed by Nino Oxilia, a 25-year-old journalist, poet, writer and director of stage and film, who would make a handful of innovative, sometimes brilliant films before his death at 28 in the First World War — a Jean Vigo-like figure of Italian cinema muto. One that did get an American release through George Kleine was completed in the fall of 1914 and premiered in the U.S. in March of 1915, L’amazzone mascherata, distributed as “The Masked Rider.” One exhibitor promoted the film by parading a masked workman on horseback through the city streets ahead of banners promoting the film’s opening at the theater. (MPW, April 15, 1915.) 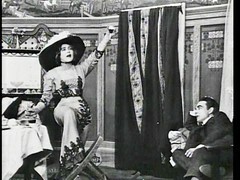 The film, and in particular Bertini’s performance, were praised lavishly in the Moving Picture World. In the opening shot of Assunta Spina, we are introduced to Assunta (Francesca Bertini) by way of a glimpse of her in a later scene on the docks of the Bay of Naples, waiting for her boyfriend, Michele. Assunta, takes a break from her daily toil as a laundry worker to enjoy a visit from her boyfriend Michele (Gustavo Serena) . . . except for an unexpected passerby: her ex-boyfriend, Raffaele (Luciano Albertini). She sees but tries to ignore him . . .
. . and while we are not clear if Michele knows him, we can almost read his lips and gestures, “Who is that guy? !” he feels disrespected by Raffaele’s bemused look toward him and Assunta, who must restrain Michele from retaliation for this perceived insult. Assunta and her father (Antonio Cruichi) see Michele off at the train station, but an unseen Raffaele (in beret, dark coat and light pants) lurks in the background. Raffaele follows her (we see him again in the background, between Assunta and her father), and after her father leaves, he approaches . . .
. . . catching up with her at dockside on the Bay of Naples. Assunta, an assertive woman, does not back down — she tells him to forget it, it is over between them. But we do not know how long they were together or when it ended . . . And Raffaele is determined to interfere. At his butcher shop, Michele’s employee hands him an “anonymous” note left for Michele: “Dearest Michele, Keep an eye on Assunta because when you are away, it seems she comforts herself with someone else. [signed] One who cares for you.” Michele immediately confronts Assunta with the allegation . . .
. . .which she vehemently, and lovingly, denies. And Michele proposes to Assunta, and tells her father that they are going to be married. Impulsive, anyone? But they celebrate with a romantic evening at the Bay. Michele surprises Assunta at the laundry with an engagement ring. And later, a big engagement party . . .
. . .with a familiar lurker, Raffaele. This time he openly approaches the table to wish them well. (Though not depicted here, he is offered wine and takes part in the toast to the couple.) We’ve been led to believe Raffaele was evil, but he seems not . . .
. . . and whatever hard feelings existed between him and Assunta seem to have faded or been reconciled. Someone has invited a palm-reader to tell fortunes. She reads Assunta’s palm. “I see blood!” Blood? Everyone including Assunta laughs at the idea! Assunta finds Michele who has gone off by himself to pout after seeing her talking to Raffaele. But she can’t change his sullen, jealous mood. Assunta approaches Raffaele, and asks him to dance . . .
. . . and Michele has seen enough. He disrupts the dance and threatens Raffaele and Assunta. The engagement party ends with this ugly scene, and Michele’s mother curses Assunta for “ruining” her son’s life. It only gets uglier. Below, seen only in distance, Michele darts into the street from inside his shop and slashes Assunta’s face — the “mark of love” as it is called in the film. A sort of branding — as if to say, I love her and no one else will again with this scarred face. The police come to the scene. As Assunta is ushered inside, she demands a mirror . . .
. . . and her worst fears are realized — her face has been brutally disfigured. So has her psyche. Assunta strikes a pose, and begins her testimony with questions from the judges. Assunta tells them she provoked Michele. They seem irritated with her and unimpressed by the story she now offers on Michele’s behalf. The judges hand down their ruling: Michele has been found guilty as charged and sentenced to two years in prison. The courtroom erupts. Assunta wails, “For two years I will not see him!” Michele’s mother follows Assunta shouting curses at her. As Michele is led out of Court, he shouts to Assunta. We are not told his exact words, but they appear to be something along the lines of, “Thanks a lot!” As Assunta vainly reaches out to him, someone in the background takes notice of this drama . . . It is the Court Chancellor, Don Federigo Funelli (Carlo Benetti). He tells Assunta that he has the power to help her — he can ensure that Michele serves out his sentence in a local Naples jail where she could be permitted to see him twice a month. But he makes it clear that money is not what interests him . . . Assunta is stunned . . . and refuses the offer. Then Assunta learns that Michele is to be sent to a prison in a distant part of the country, making it nearly impossible to see him again for two years. As Don Federigo is leaving, Assunta calls him back. Then, unexpectedly, Michele is released two months early and pays a surprise visit to Assunta. He is overjoyed to see her. She is in near-panic: she is expecting Don Federigo and has prepared a meal and set the table for his visit. Michele notices the table, but is in such a good frame of mind he sits down as if the meal was prepared for his arrival. But Assunta cannot keep up the charade . . .
. . . and she tells Michele the whole truth. He is blind with rage. Don Federigo leaves a nearby tavern and is on his way to see Assunta. Michele runs from Assunta’s house to find him. They meet in deadly embrace, just outside her door. Don Federigo stumbles through the doorway after being stabbed by Michele. He falls and dies on her floor. Assunta hears the commotion outside, turns off the lights and attempts to conceal herself. The police enter and find Don Federigo. Francesca Bertini, a true Diva in her native Italy, has been called by some the first international film star. This is certainly debatable. Assunta Spina did not get a release in America. Mary Pickford and Danish actress Asta Nielsen have a least as good or better claims to that distinction, both were well-known internationally by 1914; German actress Henny Porten, making films in Germany and in France was a major star on the European continent at the same time. It depends largely on how one defines “star,” and as with the concept of diva, individual cultures may have their own definitions with special meaning to them. Ultimately, considerations of international stardom evaporated with the onset of the First World War when American filmmakers, who unlike their European counterparts were unaffected domestically by the war, saw their film industry become the dominant force in the world marketplace as Hollywood became the epicenter of filmmaking. The film industries of Europe, despite the financial support of their governments, never recovered their pre-war share of the market. With the coming of sound and dialog film, the distinction that motion pictures shared with music as a universal language and art form ceased to exist, and in the nation with the largest market for film there was now a hard distinction between “foreign” and domestic motion pictures. Francesca Bertini was at the peak of success in the early 1920s when Fox Film in the U.S. made her an offer to star in several films, but she refused. She had established her own production company, the appropriately named Bertini Film, in 1918. In 1921 she met and married a Swiss banker Alfred Cartier, and intended to retire from film, as some of her contemporaries in Italian film would do soon. But she did not and, instead, continued to make films (including seventeen from 1918 through 1925 with her production company) up to the era of sound film. Although the First World War dampened, then ended the enthusiasm in Europe for diva films, the ascendance of Mussolini and his disdain for the decadence such films embodied was also responsible. But Francesca Bertini’s career was not as dependent on operatic drama and characters obsessed with sexual power as some of her colleagues in Italian film. Nevertheless, political change combined with general post-war economic woes lasting in Europe well into the 1920s resulted in Bertini leaving Italy in 1925 and adopting Spain as her base of operations for most of the remainder of her film career which slowed to a crawl with sound. She made her first dialog film in two versions, French and Italian, of “A Lady of the Night” in 1930 and 1931, both directed by Marcel L’Herbier. She made only a handful of films after this, including a French/Italian production, “Odette” (Caessar-Film, 1935) and “Dora la espia,” a 1943 Spanish production directed by Raffaello Matarazzo. In 1982 the director Gianfranco Mingozzi directed a documentary about Bertini, “The Last Diva,” an amazing, fascinating look at this larger than life figure from early Italian film and pre-Communist, pre-Fascist, pre-World War Italy. It is more than a simple documentary of her life and her films. It is the stage for one final performance by the ninety-year-old diva eterna, Francesca Bertini, and it will be reviewed in a separate post in the near future, along with stories and images of epic productions and the divas of Italian film in the first two decades of the 20th century.